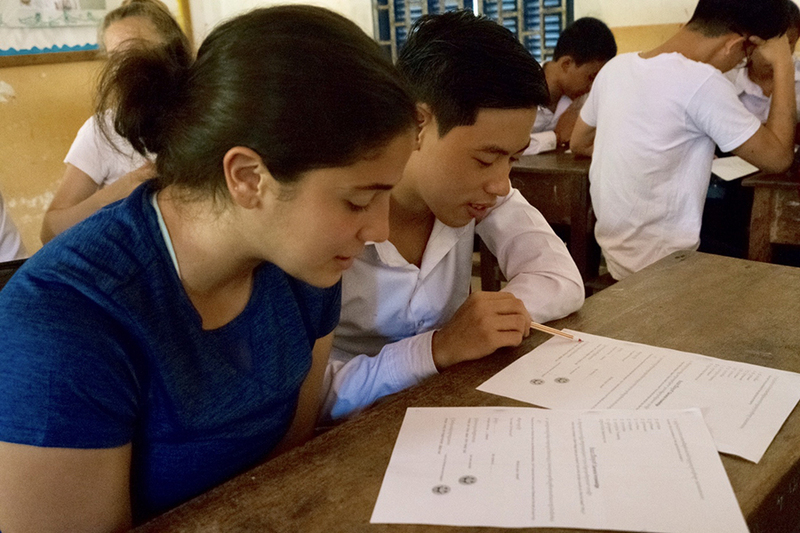 Amalis Cordova Mustafa, a junior at the TASIS School in Dorado (Puerto Rico), traveled to Cambodia this year with the TASIS Switzerland Global Service Program group. Her experiences and observations will be used to inform the creation of a Global Service Program at TASIS Dorado. You never know what to expect when you visit a foreign country, but Cambodia inarguably surpassed my expectations. You meet people who do not speak your language, yet you still develop a connection with them. You begin to understand and accept their culture, and that’s when a true change happens in you. When I finally grasped just a small understanding of Cambodia’s history, I began to sympathize with its people, and that’s when I felt the change beginning in me. Meeting people from the village and seeing their living conditions is shocking, but receiving a blessing from an old woman showing her gratitude certainly will change the way you view your own. Teaching children filled with enthusiasm to learn our language shows us how fortunate we are to receive an education. Finally, when we visit a country different from our own, the whole group is affected by what we encounter, and this Global Service Program changed not one but ten adventurous students who from now on will be connected by a shared experience. So I invite every student to challenge themselves physically and morally, to emerge themselves in a foreign country, and to place unknown people before themselves because it will surely be an enriching and humbling deed.